Steve Davis admits to being bias. Davis is entering his first season as head coach of the Olympia High School football team, but it’s hardly his rookie year with the Bears. In fact, few individuals have had a longer tenure with the team. Before becoming the top guy he spent the previous 24 years as an assistant, serving as the Bears offensive line coach. And, you certainly don’t spend a quarter-century doing something without developing a soft spot for it. First-year Olympia Bears football coach Steve Davis coaches the offensive line during an August practice. And, it’s a group that should take care of the Bears this year as well as one of the Olympia’s top strengths coming into the 2017 season will be the veteran group of offensive linemen. It’s a group that feature seven seniors who, according to Davis, have combined for 50-60 varsity starts. 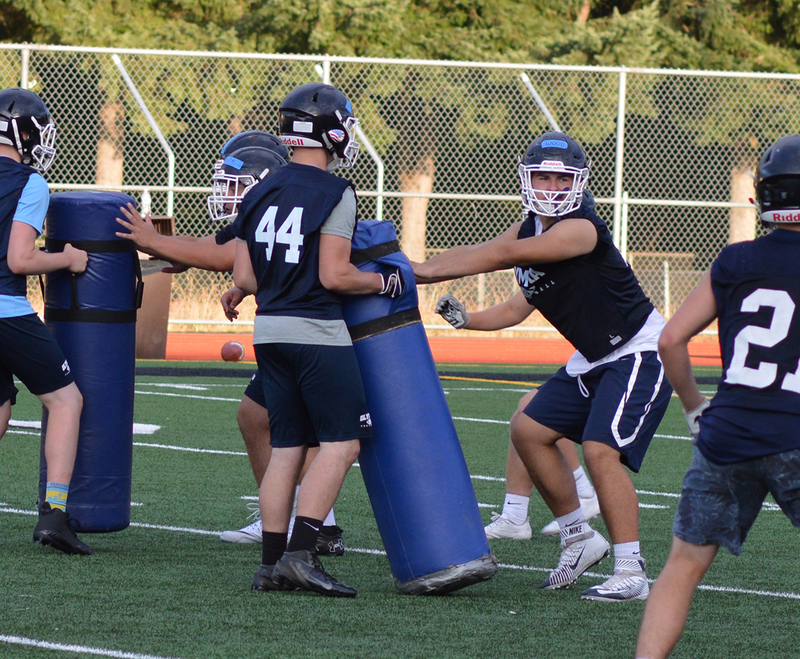 The Bears will field one of the most experienced lines in the 4A South Puget Sound League. 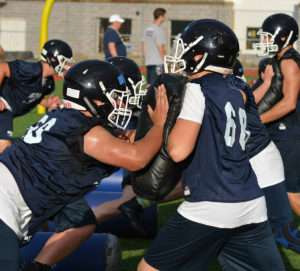 The team returns three starters in Logan Wood, Tyson Holloway and Ben Pitney, as well Vinnie Baroga, who started four games at right tackle last year, Noa Peralta, last season’s starting middle linebacker and valuable backups Isaac Muckian and Matt Mobley. Not the biggest size-wise when you compare them to other schools in the 4A SPSL – Wood and Holloway come in at 240 pounds, while everyone else tips the scales between 210 and 225 pounds – these Bears excel through familiarity and communication, having played together as a unit since elementary school. It all starts with Wood, a first-team all-league center last year, who makes the initial line call before his teammates make adjustments. It’s all about blocking schemes and what’s the best way to go about attacking the defensive front. The call can be a simple word or a hand gesture or even just a look, all to identify defensive alignments. Most of the players have been together since third grade, but the on-field communication between them really started to take off their freshman year. It’s only improved from season-to-season, hopefully reaching its pinnacle in 2017. 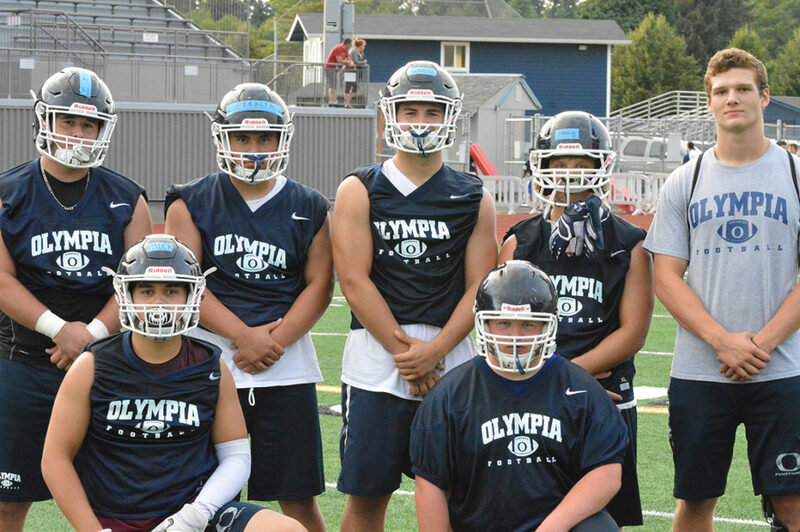 It all helps elevate Olympia’s traditional smash-mouth style of running the football, a characteristic each one of the seven embraces. And following a successful play where the line makes a correct call that springs a running back for a big play or gives the quarterback the needed time to complete a long pass, this group will merely head back to the huddle, give each other a nod and strap up for the next play. Olympia’s senior-led offensive linemen will get their first chance to shine on September 1 when they travel to play Emerald Ridge.